The bottom line is that this kind of coaching helps corporations to consistently realize and accomplish more of what they’ve set out to do. If there is one thing needed today in the corporate world, it would be to understand what corporate coaching is – and is not. 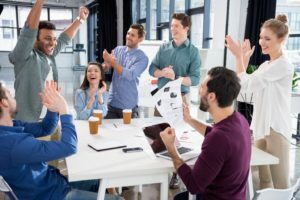 In a nutshell, corporate coaching can be defined as a motivational method used to inspire employees to be more productive, reach defined goals, and enjoy more success – with better mindsets and attitudes. And when corporate coaching is experienced by top-level management, the positive effects trickle down – impacting the entire organization, transforming and improving the workplace environment for all. Registered Corporate Coach™ Training offers professionals the benefits of a fast-paced, high content program specifically designed to get to the heart of the issues negatively impacting today’s hectic workplaces. RCC addresses the needs of management – providing the leadership tools that allow them to first recognize and define their current issues, empowering them to immediately (and skillfully) implement much-needed changes within their organization. Unfortunately, though Executive Coaching has been around for quite some time, many professionals have either no real understanding or a genuine misunderstanding of what corporate coaching actually is (and consequently) the many benefits they are missing out on. We would sincerely like to help change that. I routinely make myself available to answer questions from CEOs, coaches, consultants, managers, therapists, human resource professionals, and trainers who want to know more about the benefits of coaching within a business environment. CONTACT US today – and we’ll gladly answer your questions – or listen to your input. In fact, we believe that the best way to improve RCC™ Training is by hearing from executives and others who have experienced it first-hand. And most of all – tell us what you NEED as a leader in today’s crazy and stress-filled workplace. Whatever your needs, there’s a good chance we can provide you a successful solution for that!